There are multiple versions of Casper, the documentation is scattered and constantly evolving, it’s now being genetically spliced with sharding — and even if none of that were true, it’s heavy stuff. But if you set aside the proofs, I think what it looks like in operation — at least the essence of it — is pretty intuitive. Here’s a simplified sketch of how I understand Casper to work. Normally one block at a time is added to the chain, stakers all vote for it, it’s finalized, everything’s groovy. A Casper chain with 100 equal stakers (voters). The top number in each block is the number of votes the block received; bottom is the number who voted to finalize the previous block. Blocks A and B are finalized (green), because they received ≥2/3 votes in their own rounds (heights 0 and 1), plus ≥2/3 finalization votes in the next round (h=1 and 2). C is the current nominee for finalization (yellow, because it received 2/3 votes — aka justified), but not yet finalized: whether it receives the required 2/3 finalization votes will be tallied in the next round, at h=3. But now and then competing blocks at the same height may split the chain. Due to lag, or temporary network partitions, an attack, whatever. Two rounds later, C has been finalized: it received 60 finalization votes from voters for D, 40 from E. But the chain has now split between D and E, with neither winning the 67 votes needed to be nominated, a prerequisite for being finalized. F is the first block since C to gain the 67 votes needed to be nominated. But in the next round (h=6) it gathers only 25 finalization votes (20 from G voters, 5 from H): F’s nomination failed, and voting for fresh nominees continues. Crucially, however, even a failed nomination has implications for its voters. A staker who voted to finalize a nominee cannot vote for a conflicting nominee — one not descended from the one they voted to finalize — until a new one gets nominated by other voters. A staker who violates this “no-reneging” rule gets slashed, ie, loses their stake! The next nominees after F are I and K. I’s nomination also fails, getting only 15 finalization votes. Note here that the 25 who voted to finalize F (20 of the G voters + 5 H voters) can only vote for descendants of F — until I is nominated, which frees them to vote for its descendants as well. Eventually, some nominee gets >1/3 finalization votes. This is a crucial turning point, because after this, no conflicting branch can win 2/3 nomination without some staker getting slashed. So once a block exceeds 1/3 finalization votes, no branch conflicting with that block will probably ever get nominated/finalized. K’s nomination technically failed: with 35 finalization votes, it fell short of the 67 needed for finalization. But because it got >33, K is now soft-finalized (light green): assuming no staker is willing to be slashed, the eventual finalized chain is guaranteed to be one of K’s descendants. The conflicting chains J and L are doomed. When there’s a split, stakers vote each round until a block N gets 2/3 votes and becomes the current nominee. 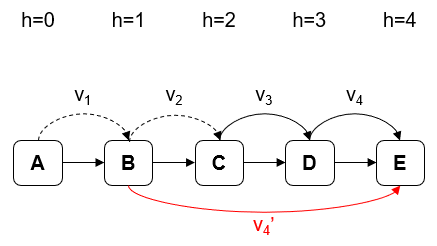 a) N gets ≥2/3 finalization votes: N is finalized, and the chain is reunited. 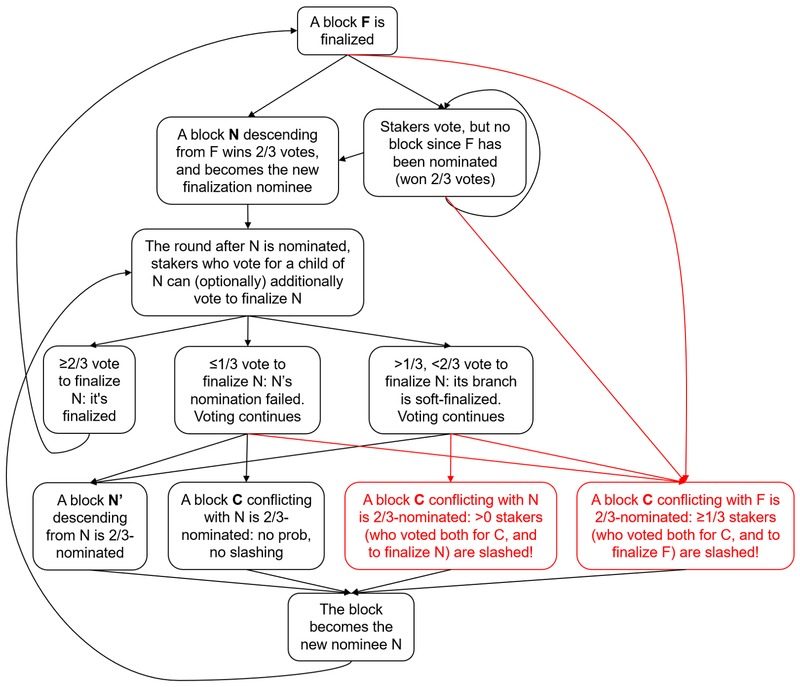 b) N gets >1/3, <2/3 finalization votes: not finalized, but N’s branch is soft-finalized — the eventual finalized block is highly likely to be a descendant of N.
c) N gets ≤1/3 finalization votes: not finalized. Voting resumes until another nominee gets 2/3, and it may conflict with N.
Here we see M eventually getting nominated (with 80>66 votes) and then finalized (85>66 finalization votes). This also implicitly finalizes all M’s ancestors (K, H, F, D, …). The chain is reunited and continues from M.
In Casper FFG, every vote specifies both a target block (the one you’re voting for) and a source block (an ancestor of the target that 2/3 previously voted for). The no-spanning rule means that, for example, if you cast a vote for a target block at height 7 with source at height 5, you can’t cast another vote for a target at height ≥8 with source at height ≤4: the second vote spans the first. 3. No ancestor block of B between A and B (ie, at height ≥h, <h+k) received 2/3 votes. An example of how FFG’s no-spanning rule, because it involves specifying a vote’s source, is stricter than the above no-reneging rule. You’ve voted for B (with source A) at height 1, C (source B) at h=2, and D (source C) at h=3. Now, at h=4, you vote for E with source D. This is fine: none of your four votes span each other. However, if you voted instead for E with source B, this would span your previous vote (D with source C), and you would be slashed — despite none of these blocks conflicting with each other. For some other work on “Why is the FFG paper’s no-spanning rule unnecessarily slashing these votes?”, see Daniel Lubarov’s tweak from June and Justin Drake’s further refinement this week. I would argue that the no-reneging rule is more intuitive, and also preferable in that it eliminates the confusing source parameter in votes. However, clause 3 of the no-reneging definition above (“No ancestor block of B…”) is arguably clunkier to enforce than the no-spanning rule. One way to implement clause 3 is a multi-step slashing protocol: I post a challenge to your pair of votes (finalizing A, voting for B); you have some period (eg, a month) to respond with a block at height >A, <B that won 2/3 votes; if you don’t, you get slashed; if you do, I get slashed. Or there may be simpler ways. In any case, either the no-spanning rule or the no-reneging rule leads to the nominee-voting logic described in the walkthrough above. By popular request, here are proofs that the no-reneging rule ensures accountable safety and plausible liveness, as FFG’s no-spanning rule does. 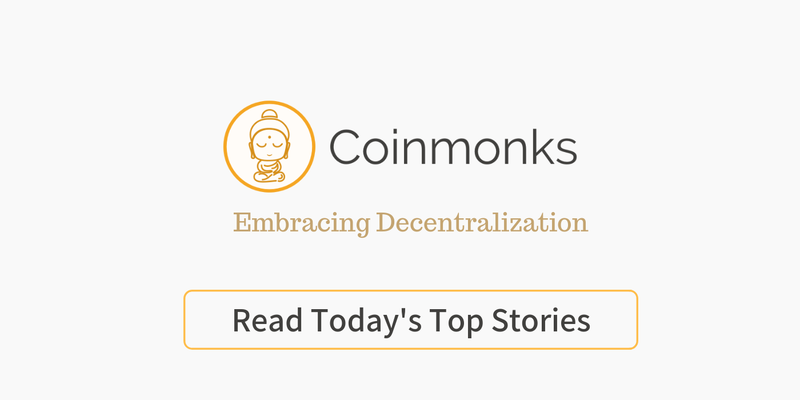 Safety: We want to show that if two conflicting blocks are both finalized, ≥1/3 of stakers get slashed. Let the two blocks be A at height h and B at height h+k. Let B’ at height h+j be the ancestor of B (or B itself) with the lowest height >h, which got 2/3 votes. (Since B itself got 2/3 votes, there is always at least one such block: B.) It follows directly from this definition that no ancestor of B’ between A and B’ got 2/3 votes, and that B’ conflicts with A. Therefore, by the no-reneging rule, the ≥1/3 of stakers who voted for both A and B’ get slashed. No-spanning implies no-reneging: As a bonus, here’s a proof that any violation of no-reneging is also a violation of no-spanning. Suppose you violate no-reneging, meaning: 1. You voted at height h to finalize A at h-1, 2. Later (ie, at height h+k) you voted for conflicting block B, and 3. No ancestor block B’ of B between A and B got 2/3 votes. Since a vote’s source must have 2/3 votes, it follows that your source in your vote for B must have been at height h-1-j: ie, lower height than A. Therefore, your vote for B (height h+k, source height h-1-j) spans your vote to finalize A (height h, source height h-1). This doc represents my understanding only and may contain errors — if so, let me know! I am not a Casper expert. This is intended to clarify Casper’s workings for people already vaguely familiar with it. If you’re coming in completely green you may find these helpful side reading: the Ethereum proof-of-stake FAQs, Blockgeeks’ Casper crash course, jon choi’s Casper 101, and the Casper FFG paper. I’ve intentionally simplified some important aspects. Eg: Casper FFG operates on checkpoints, not on every block, because voting to finalize every block would produce a lot of overhead for little benefit. But there’s no conceptual reason the algorithm wouldn’t work on every block: a checkpoint is literally just every 100th block. So for simplicity I’ve presented everything in terms of blocks. Simplification #2: I talk about “before” and “after”, eg, “no voting for fresh conflicting nominee B after you vote to finalize A.” But in practice, time is hard to enforce: just because I detect your vote v1 before v2 doesn’t mean you sent them in that order. So when I use “after” in this post, I really mean it as shorthand for “at a higher height”. In other words, I’m assuming stakers cast votes in increasing order of height — well-behaved stakers should do this. But slashing rules can’t really enforce timing, only height. Simplification #3: I assume every staker votes every round, and the set of stakers never changes. I don’t think removing either of these assumptions would be fatal to any arguments above, but it would make them messier. In parts of the walkthrough, I come close to assuming no staker will behave (vote) in a way that would lead them to get slashed. Of course there are attacks where the attacker accepts the cost of being slashed, but these will be very rare, and my primary goal is to show what Casper looks like in operation “most of the time”. I’ve used some idiosyncratic terminology where I found it clearer or more concise — “nominee” rather than “justified”, “staker” rather than “validator”, etc. Apologies for any confusion this causes. Most of this post is just fleshing out ideas I originally tried to fit into tweets. Thanks to Justin Drake, @matthew_d_green, Dan Robinson, Danny Ryan and others for very educational discussion and corrections. Also to Jane’s Addiction for the timeless second half of Ritual de lo Habitual, which helped me get this done. Cryptocurrency enthusiast with a background in software development, finance and teaching. @JaEsf on Twitter, work http://calibratedmarkets.com/.